I can’t speak for every single child on the face of this earth, but I can tell you in my experience with children this is true: Dress up is awesome. In our house, dress up is a given. At any moment, there is a very, very, good chance that Alex is either wearing a costume or at least pretending that he is someone else. His current costumes include: Buzz Lightyear, another Buzz Lightyear, Captain America, Batman, a Vampire and a Knight. Of course, those are the actual costumes and don’t include the other characters that he will become when wearing one of them. It also doesn’t include his pajamas, many of which are costume-like: Spiderman, another Buzz, Woody. And it certainly doesn’t include his imagination; all of the times when he just says, “I’m _______ now!” and runs off and suddenly is that new character. This past weekend Alex and I went to a birthday party. A sixth birthday party, to be exact. In this big beautiful house were approximately one bajillion kids, mostly in the five to six year range. Those one bajillion kids were loud and busy and did I mention there were at least one bajillion of them? Naturally, because this was a birthday party at a girl’s house, the costume selection was, well, “girly.” A fairy here, a princess there. Costumes abounded with frills and poofs and cuteness. Naturally, my child who is obsessed with wearing costumes wanted to wear a costume. So, he did. For a long while he was Tinkerbell. A very cute Tinkerbell who also happened to be “damaging” everything around with a “sword,” which was the wand. Alex ran around the house in that costume at top speed, chasing kids, being chased by kids, “BOOM”ing and “SMASH”ing everything in his way. He owned that costume. I would be lying if I said, “I didn’t think anything of it!” because, well, of course I did. I’m about as open minded as you get, especially when it comes to gender norms, but I am not an idiot. I know that there are many people who have issues with a boy wearing something pink or frilly, or playing with barbies, or, in this case, dressing up as a female fairy. And, I’ll be honest, I almost said, “No” when Alex asked me to help him get the costume on. Not because I care, but because there were lots of kids and some parents there; kids and parents who I didn’t know. The kids and parents there who I do know didn’t bat an eye, thought it was adorable, sweet, who cares?, wished their more “conservative” husbands could see it, etc. I got one eye roll from a parent I didn’t know, but I am even more sad to say that I saw multiple children making fun of my son. It took everything in my willpower to not say something. To not pull aside those little kids and scold them for being mean. To not explain to their little five-and-six-year-old brains that making fun of anyone, ever, is not okay. That just because you think something or someone is different doesn’t mean it’s okay to make fun of it or she or him. But, I didn’t. I didn’t because Alex had no idea. He didn’t know that those kids were not simply stating a fact: “Look at that boy! He’s in a girl’s costume!” He didn’t catch the tone. He didn’t see the giggling and pointing. He was having a blast, so I didn’t say anything. I think it was the right decision, but I’m not entirely sure. They weren’t my kids to scold. They certainly were not my kids to attempt to teach. It just makes me sad that, in Kindergarten, these things start. That these kids may not have parents who think it’s important to teach their offspring that not only is different okay, but also it’s good. Maybe their parents are still a few decades back in their thinking, and it can’t be my business to try to change them. Or maybe it means none of that. Maybe one kid was a little mean and the rest just followed suit. What kid wouldn’t want that? 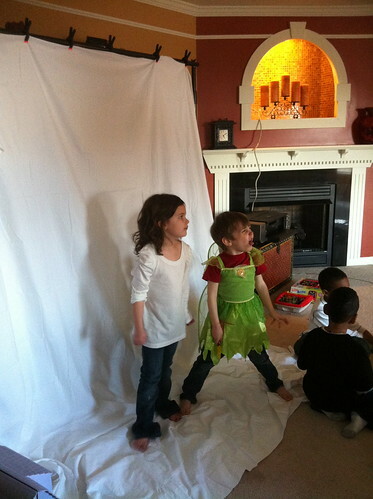 As soon as I read that some of the kids were making fun of him, I walked over to Juliana and showed her the picture of Alex in the Tinkerbell costume. I asked her if she thought it was weird that he was wearing that costume and she stared at me like she had no clue what I was talking about. She said that it is fun to play dress up and didn’t see any reason he shouldn’t be wearing it. I hoped that would be her response, but with Kindergarten and new friends, etc it was a good time to have a refresher that we don’t make fun of people. It’s unfortunate that some of the other moms who were there need to learn that lesson. Alex is awesome and dress-up is fun and you are a cool mom for making him feel comfortable. I hope it wasn’t my kid! Although she has a bff whose brother dresses up with them all the time, so it probably wasn’t a big deal. I can’t believe someone rolled their eyes – people are dumb. These pictures are priceless! 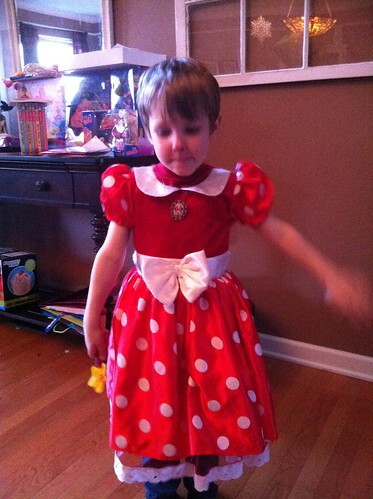 He makes an adorable Minnie Mouse, I mean princess. I can’t believe that some of the other kids were making fun of him. I totally understand your hesitation on saying anything though. I’m just glad that he didn’t get what they were saying.